Having a wedding, corperate event or one hell of a party. Call us because we have the best oyster and we know our stuff. 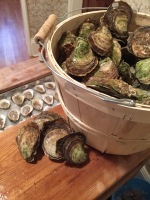 Cant make it to PEI, or an oyster bar, NO problem we will ship these beauties right to your door. if you wanna see Valley Pearl at work. Take the Tour. Enjoy our oysters and perhaps a beverage and learn everything you need to know about these delicious creatures.